In contrast to spin polarized charge currents, where a charge current is associated with a flow of spins and associated angular momentum, pure spin currents comprise a flow of spins without any net charge current. One potential advantage of pure spin currents is reduced Joule heating and Oersted fields while retaining the functionality of spin currents to manipulate magnetization. An attractive way to employ pure diffusive spin currents is a lateral spin valve geometry (Fig. 1), consisting of two ferromagnetic electrodes which are spatially separated but connected via a nonmagnetic spin channel with low spin orbit coupling, e.g. 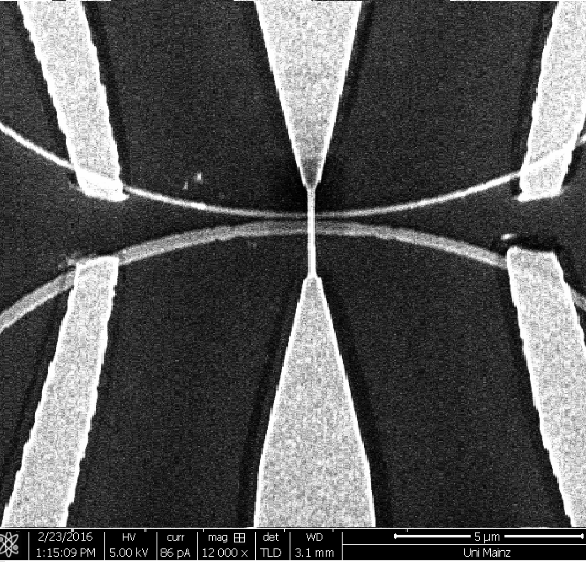 a copper nanowire [1,2]. In such a lateral spin valve, a spin polarized charge current is generated by applying a charge current between the injector and the nonmagnetic spin channel. Here the orientation of the spin current is set by the magnetization direction of the injector. 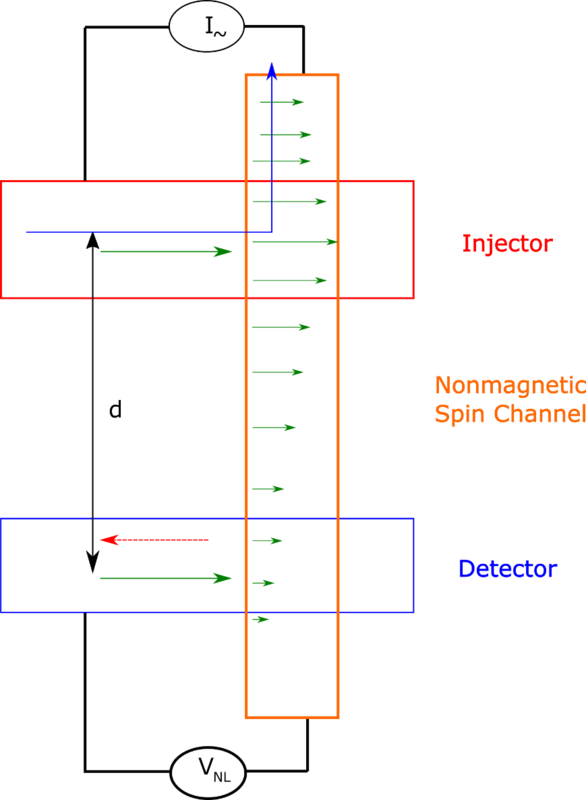 At the interface between the injector and the nonmagnetic channel, spins enter the nonmagnetic channel and the formerly spin independent chemical potential of the nonmagnetic channel becomes spin dependent. The generated spin current will diffuse in all directions, including down towards the detector. During this spin transport, the spin current decays due to spin-relaxation processes. When the pure spin current reaches the detector, the spin current will be absorbed and can be detected by a non-local voltage VNL. Furthermore, the spin current can be functionalized to exert a torque on the absorbing magnetization and employed to switch a memory element or displace a magnetic domain wall. The spin current generation. 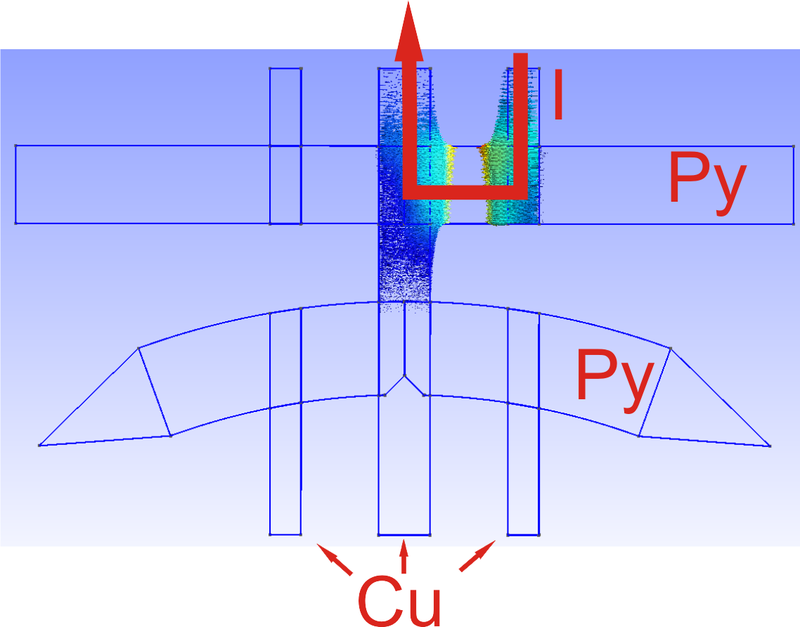 Our research investigates different sources for spin currents, e.g. electric or thermal spin injection based on highly spin polarized injector electrodes [3,4] or the spin Hall effect . The spin current transport in the nonmagnetic channel. The spin diffusion lengths and spin lifetimes are investigated for different geometries, temperatures and materials. Graphene for example is a promising spin transport material due to its predicted low spin orbit coupling . The spin current functionalization at the detector. In our previous work we demonstrated that pure spin currents can be employed for efficient domain wall displacement with the observed efficiencies more than an order of magnitude larger than for conventional spin polarized charge current induced domain wall motion [7-9]. Finally to probe the ultimate speed limit we also go beyond diffusive transport at the Fermi level and study superdiffusive spin currents using hot charge carrier dynamics on the fs timescale . Figure 1: Schematic of a lateral spin valve consisting of two ferromagnetic electrodes (injector and detector) bridged by a nonmagnetic spin channel and a simulation of the real spin current distribution. Figure 2: Scanning electron microscope image of a lateral spin valve. Two permalloy half rings of different width are connected by a nonmagnetic copper wire.